Service Level Agreement (SLA) is the understanding between service provider and customer to offer service from service provider. “SuiteCRM Service Level Agreement” extensions from VIPL Team support SLA and its defined by users. You can create notification and escalation procedures in terms of which issues are subject to escalation, the escalation criteria to be applied, and the action to execute upon a specific escalation level. SLAs are applied to case/tickets that match the defined parameters or criteria. You can also send alerts to selected resources when there is a potential SLA violation. Time base trigger on various case if status of the case has not been changed in due time defined in SLA Process. Decrease the waiting time from customer for any issues by defining appropriate SLAs. Increased customer satisfaction by Constructing well-defined SLAs. A good SLA must be based on a constant parameter that does not vary during the issue's life cycle like the Title, Submitted Date, etc. Parameters like Status,Is it Reproducible,Severity etc are subject to change. 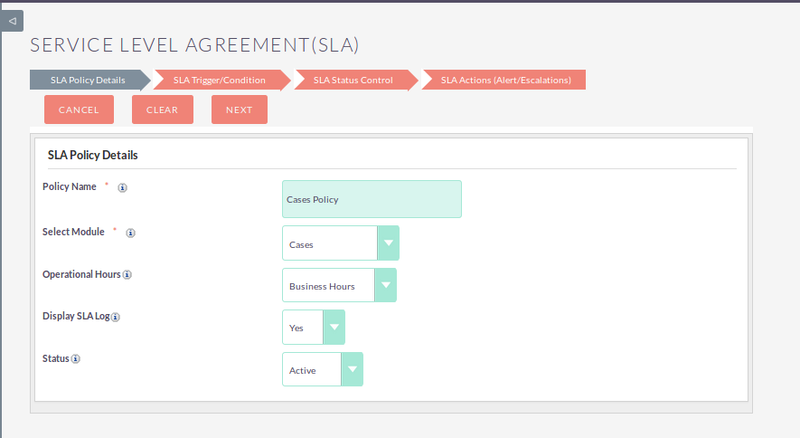 Manage SLA with multilevel escalations, if ticket is not closed within the defined target time.